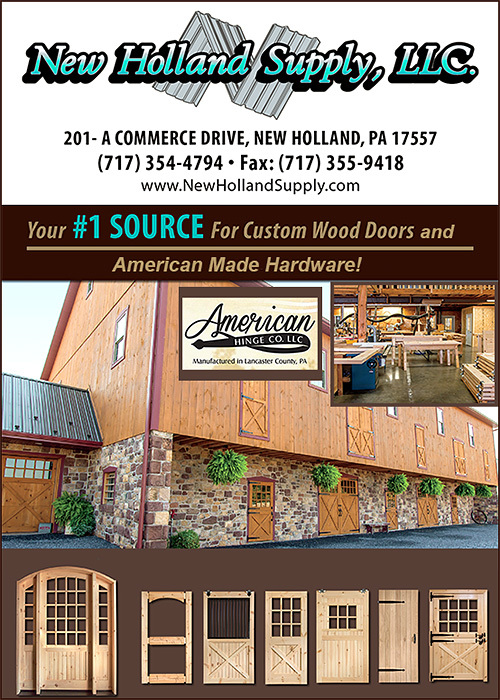 The Custom Wood Doors and Handmade Door Hardware which New Holland Supply is known for, will add style, value, functionality and beauty to your barn. We ship Nationwide and have customer service second to none! Since 2003 New Holland Supply has been designing and crafting durable upscale custom Barn Doors, Garage Doors, and Entry Doors that add both beauty and functionality to enhance your barn, pole building or structure. Every employee is hand selected and must meet rigorous standards in both performance and customer service— so that we can ensure your experience with New Holland Supply is wonderful from start to finish! Is It True That New Holland Supply CUSTOM builds These Doors? Yes! We offer Quality Built Custom Doors with many styles, sizes & configurations. From a simple entry door to an upscale sliding barn door, we can help you to design and build a door of your dreams. Our craftsmanship and dedication to your complete satisfaction is well known in the industry! We carefully consult with each of our clients sending photo selections, choice of wood species, and style ideas so that every door is truly a work of art! What Kinds of Wood Species Can I Select From? With New Holland Supply you have an option to have your door built with materials such as Pine, Cedar, Doug Fir, Spanish cedar or Metal and Aluminum, and to use different windows or hardware with each custom door. We have a large selection to choose from using photos from other custom made doors, or, you can design your own and we will accommodate you! So I Could Have A Metal Door Too? Yes, while the majority of our Doors are made from high quality woods, our craftsmanship and experience translates seamlessly into Metal Doors for people looking for beautiful custom made doors to enhance the beauty and functionality with zero maintenance of their building. What types Of Custom Doors Does New Holland build? What Kinds of Options Are Available With The custom Doors? So How Does My Door Selection Process Work? We build in our shop- sliding doors, stall doors, dutch doors, overhead doors, pre-hung doors, dutch windows, and both interior and exterior doors. We are a small company who believes in customer service. You will have a person with you from start to finish. What About The Hand-Forged Hardware At New Holland Supply? Our line of Hand-Forged Hardware offers superior quality and will truly enhance both the looks and the durability of your doors! We offer a complete line of Cannonball Door Hardware and other Hardware such as latches, hinges and more! We are happy to help you with requests and questions to ensure you get the proper and most functional hardware for your application. Contact New Holland Supply Today! Beautiful Barns take attention to detail and planning— and at New Holland Supply we make it easy to find everything you need for your doors and hardware right here! Our craftsmanship and fair pricing have made New Holland Supply the “go to” place in the USA. We can help you wherever you live and look forward to your call today!